No flight into the “relatively safety of gold” given all the uncertainty and risk. Tests July 2017 lows and near the low for the year today and bounces. But rise is limited. Those topics can be thought as risky events and in the old days, might have led to flights into the safety of the gold. That’s not to be, as the precious metal is more focused on the rising dollar instead. Today, gold is trading down -$0.27 on the day at $1212.21. That is near mid range – off the lows at $1205.89, and also below the highs at $1217.09. 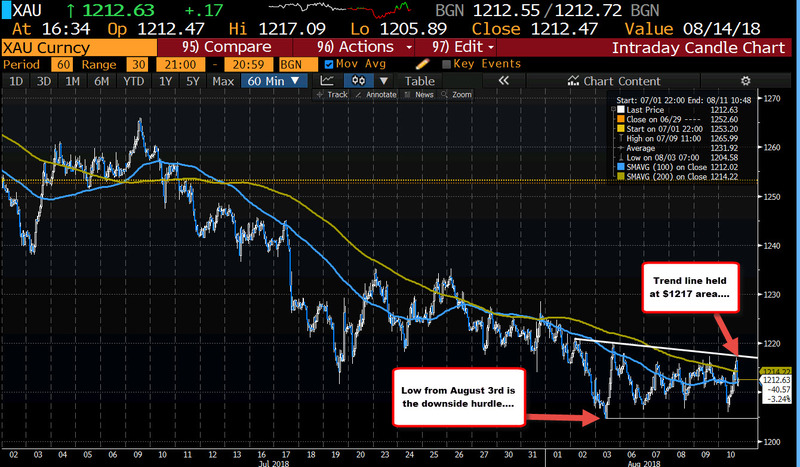 Technically, the price low today reached just above the 2018 low at $1204.58. That low (from August 3rd), took out the low from July 10, 2017 at $1204.90 by $0.32 and failed. However, the correction has not actually raced higher. A battle is going on. Drilling to the hourly chart below, the rally today moved right into a topside trend line and stalled. The price moved above the 100 and 200 hour MAs in the process at $1212 adn 1214.22 currently, but the price is back down and testing the 100 hour MA now. A move below with more momentum still has the lows from August to get below. Since August 3rd, the pairs lows has been above that low level. At some point, the precious metal will make a run – either higher or lower. Keep an eye on the technical clues from the daily and hourly to show the way. 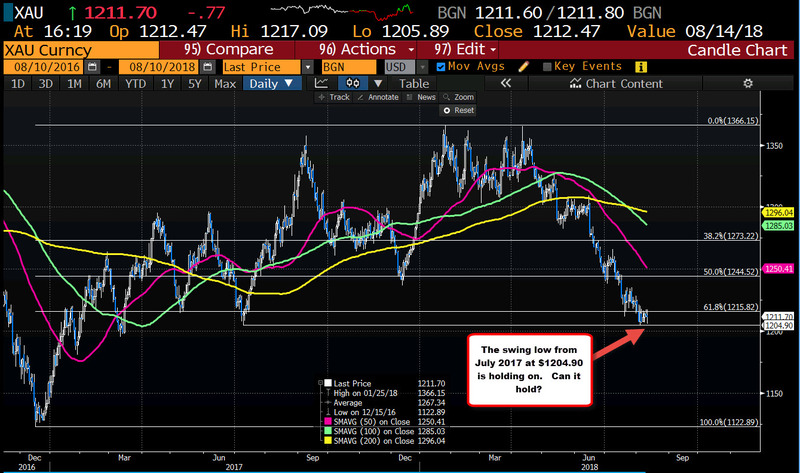 If you want a clue, the dollar seems more the thing to watch vs. the risky stuff that is going on.